Brothers and sisters of the whole world! 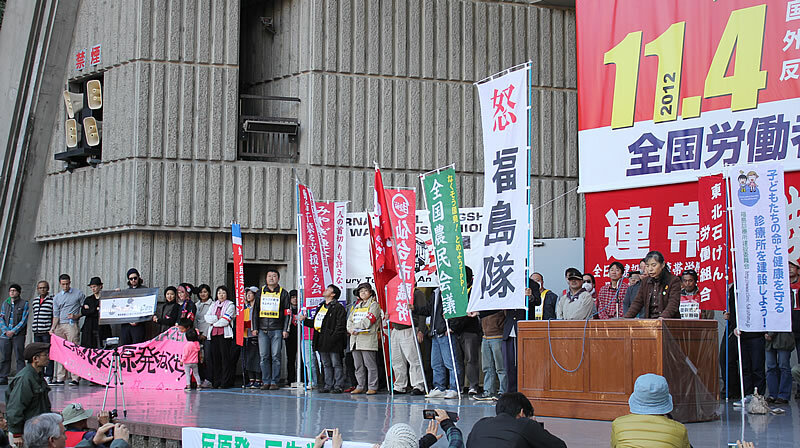 On March 20th, 2011 in Tokyo, we held a rally with about 1500 participants to raise angry voices at a serious situation, which was brought about and exposed by the recent Tohoku (East Japan) Earthquake. 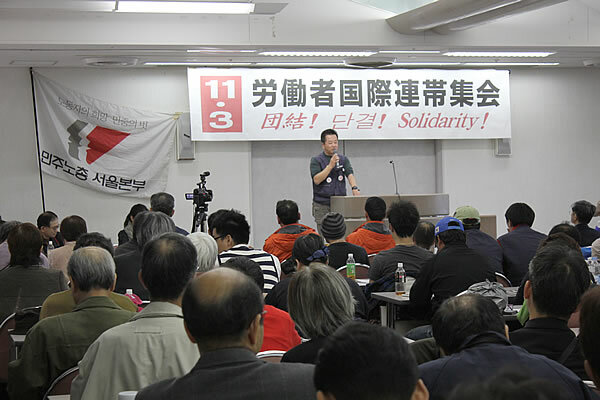 It was the only action of protest, while networks of transportation has been disrupted not only in earthquake-affected Tohoku but also Tokyo and Kanto area and the government is putting pressure to refrain from organizing independent actions in the actual circumstances. The purpose of the rally was to organize anger of people against the awful and brutal reality, to denounce the deceitful policy of the government and to demand disclosure of the facts on the whole development in concern with the disaster. A large quantity of relief goods are brought to the rally, including several hundreds kilogram of rice, several hundreds of gas cylinders and other necessary items. Those materials are instantly sent to the suffering areas together with abundant relief donation. 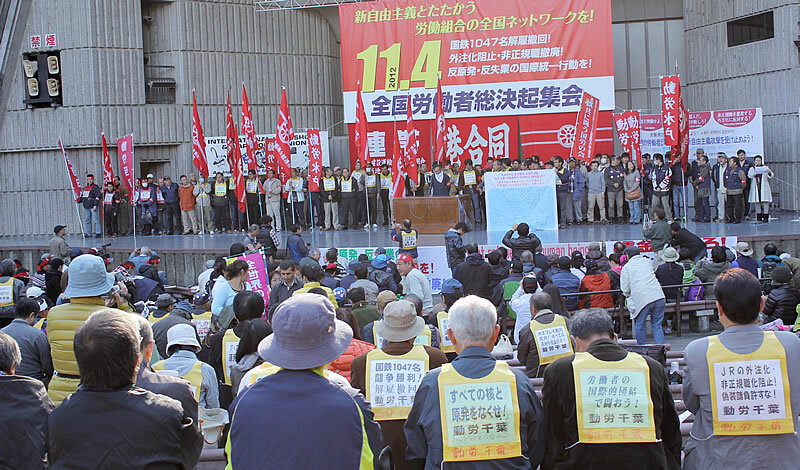 The rally issued an appeal, calling on a nationwide struggle to fight mass dismissal and a worldwide campaign to demand immediate shutdown of all nuclear plants. Confirmed death toll is approaching ten thousand and nobody knows how many it will be. It should be noted that only few people were killed by the earthquake. But the ensuing tsunami was the major cause of the lost lives because no effective administrative measures had been taken to prevent the disaster. 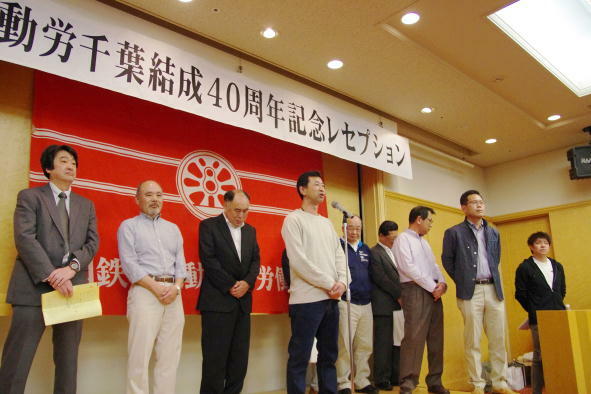 Hundred billion yen of budget for the construction of levee in dangerous coast areas had been cut off by the administration of the Democratic Party, not to mention the formers Liberal Democratic governments. The disaster is man-made. The logic of capital has brought it forth. Many stricken areas have still been abandoned, while only a part of the shelters are exceptionally provided with the governmental relief goods only in these couple of days. In those shelters and hospitals, which have got no supply of foods or medical treatment, an increasing number of people is driven to death. The floors of the most hospitals are full of patients. Lack of means of transportation hinders sick people in shelters from being sent to hospital for necessary treatment. Not only the coast areas, which are suffering from a devastating damage but also inland cities like Sendai of Miyagi prefecture have been under terrible condition without foods and gasoline. It is caused not by the lack of the necessary materials or means of transportation but by the inaction of corporations concerned, which hesitate to make extra expenditure required for making detour for transportation in face of ruined normal road. And the government remains indifferent. A lot of people are being killed by the inaction and inability of the government. This is the reality of market economy. Moreover, the government has given an instruction that no relief goods are directly sent to shelters individually or privately and they are to be brought to the windows of the governmental or municipal offices for transportation. It is reported that water supply has begun in a part of the affected areas. 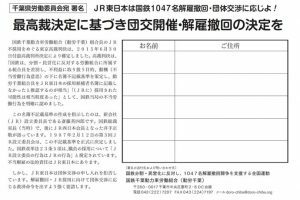 But a bad news came that in water in Fukushima prefecture radioactive materials above the normal value are found and it is forbidden to drink water. Shipment of several sorts of vegetables and milk was prohibited in fear of radioactive contamination in Tohoku as well as Kanto areas. Wrecked nuclear plants are letting out radioactive materials of high level every day and night and driving the inhabitants in the surrounding areas in a growing fear. Yesterday a black smoke rose up from the reactor and the works to recover electric supply and cooling down of the reactor are hampered. Repeated blasts caused exposure of used fuel rods. It is still impossible to assess the actual condition of radioactive core and the worst case is approaching. In face of this grave situation, the government has totally abandoned to take necessary and effective measure for evacuation in fear of creating panic. No information is given on what could happen tomorrow and people are forced to live in terrible fear. But people there are fighting the disaster and making every effort to live. For workers, farmers and fishermen, there is no place to evacuate. 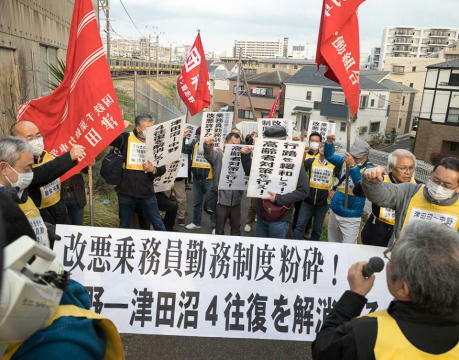 Anger and hatred are mounting against the administration and authorities concerned that had promoted construction of nuclear plants, insisting that nuclear energy was absolutely safe. We call on all the friends around the world not to let “them” repeat the same disaster. We pledge to fight to live and confront squarely whatever danger assaults us. 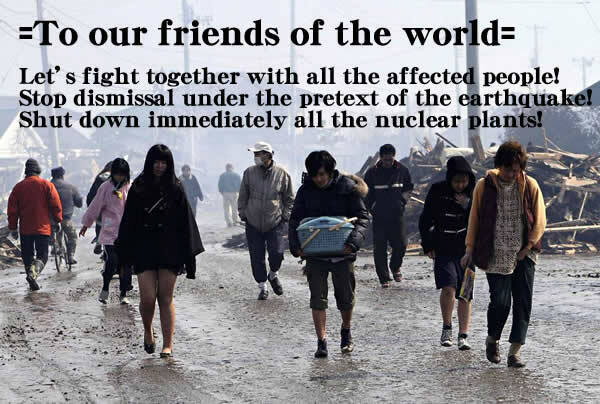 Let’s rise up together with us to abolish nuclear plants and nuke once and for all. 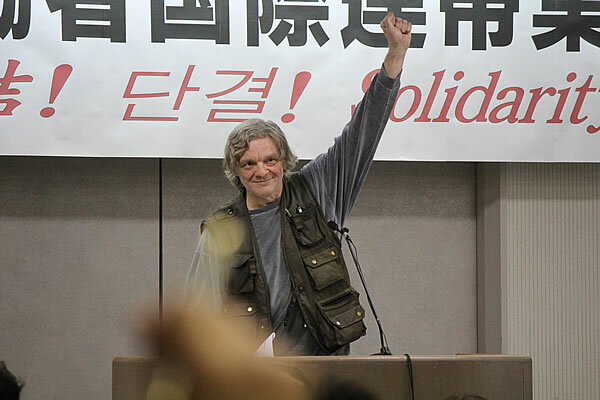 We urge you to fight to overthrow those who are promoting nuclear plant construction and seeking only capitalist interest at the sacrifice of working people. 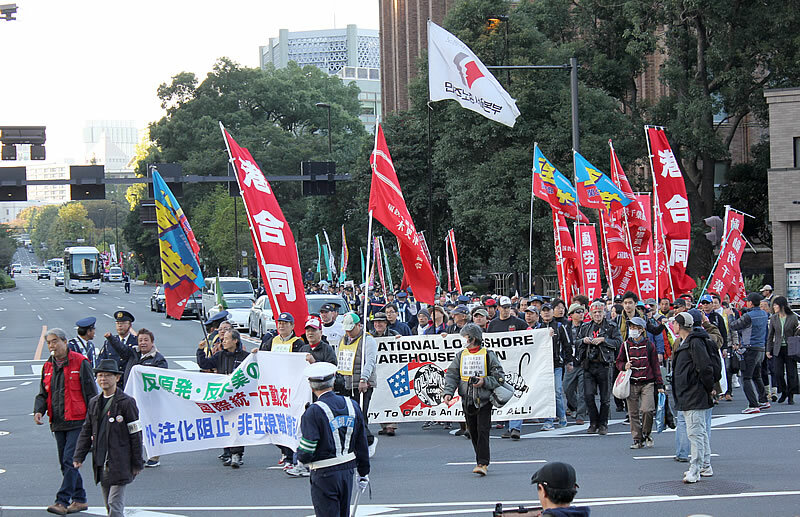 Not only the disaster areas but also the whole areas of East Japan are facing massive dismissal and unemployment. 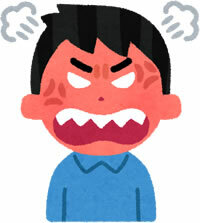 Tens of thousands of workplaces are hit by the earthquake and tsunami and immobilized in Tohoku and Kanto areas. 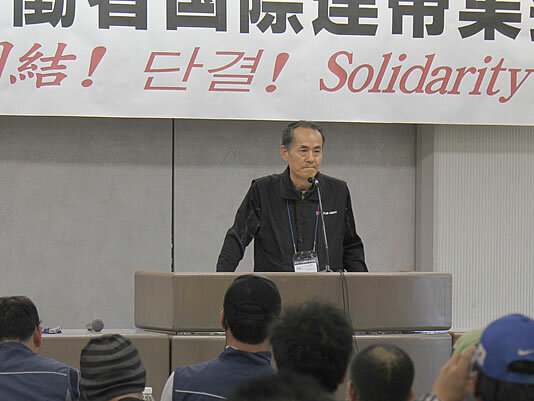 A large number of factories are obliged to stop operation all over Japan, because major car manufacturers and electric machinery corporations have promoted outsourcing and their production is dependent on sub-contractors or sub sub-contractors which provide them with necessary parts and they are located in many cases in the disaster area. Therefore, not only the directly hit workplaces but also workplaces of other areas are indirectly affected by the disaster, producing a huge number of losses of jobs temporarily or permanently. A large number of workers who are in irregular employment are thrown out of daily work without any assurance or allowance. The number of possible jobless people is beyond assessment. No rescue measure is offered or planned for those jobless workers. 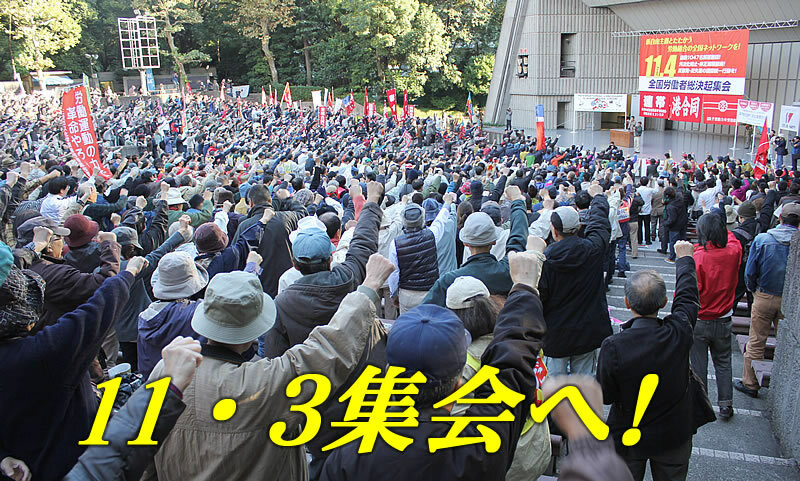 Japan is going to be a huge unemployment peninsula as a result of the earthquake. What has happened and is happening now is evidently far beyond our present power. We need to develop our power through establishing close links with mounting voices of angry of a large number of working people in order to confront the horrible situation before us. 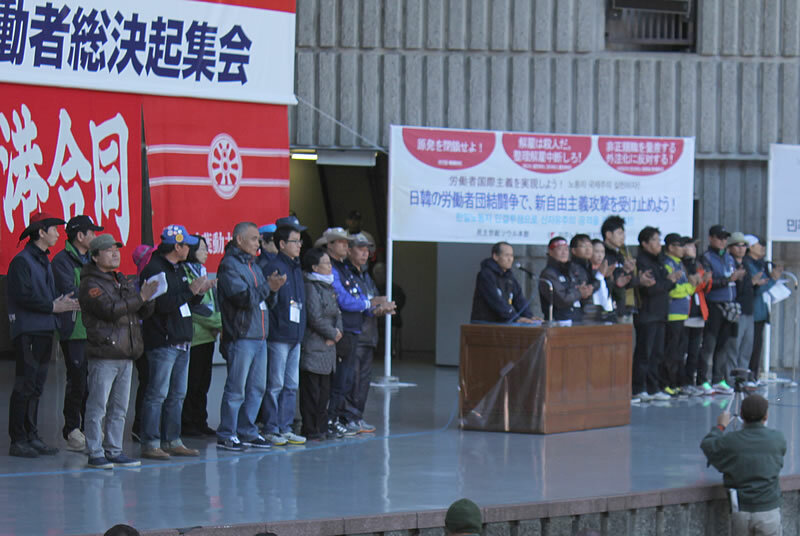 On March 16th, Doro-Chiba together with the National Coordinating Center of Labor Unions has set up People’s Earthquake Relief Center. 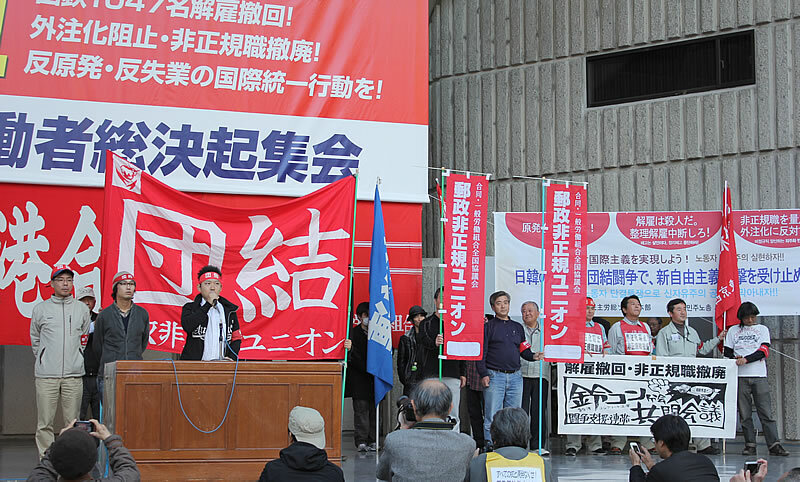 We are determined to gather all power for the relief activities, calling on all working people to “unite and fight to live” in a nationwide campaign for the suffering people in Tohoku area. We also call on all brothers and sisters of the whole world to send donation of unity and solidarity to the address below. 도로치바는 어제 집행위원회를 개최해 전국노동조합교류센터와 도로치바가 ‘동일본 대지진피해 구원대책본부’를 출범하기로 결정했다. 본부는 전국노동조합교류센터에 둔다. 또 이와 아울려 조속히 현지 대책본부를 개설하는 것을 확인했다. 현제 간토(間東)과 도호쿠(東北)을 잇는 간선 도로를 경유한 구원물자 수송은 자위대에 의해 막혀 있고 아예 진행할 수 없다. 현지에 들어갈 수 있는 최단 길은 니가타(新瀉) 루트이다. 따라서 니가타에도 지원물자 집적거점이 되는 대책본부를 조속히 개설하는 것도 화인했다. 현지(센다이)의 보고에 따르면 해안부의 괴멸적인 타격을 받은 지역 뿐만 아니라 미야기(宮城)현 전역에서 물,음식,휘발유가 없어졌고 심각한 상태에 놓여 있다고 한다. 몇만,볓십만 피해자들이 간정권의 무위무책과 파멸적인 ‘피해대책’ 속에 죽음을 당하게 되고 있다. 벌써 닷세가 지났지만 곧바로 할수 있을 것인 물,음식,의약품,연료,담요 등 최저한의 구원물자의 현지 집적마저 진행되어 있지 않다. 뿐만 아니라 “혼란을 가져온다”라고 해서 그 일체가 막히고 있다. 정부가 진행하고 잇는 것은 통제와 질서유지와 거국 일치 쳬제 마련 뿐이다. 그데로는 간신히 죽음을 면한 피재자들을 추움과 기아가 덮치게 된다. 노동자 스스로의 힘으로 자주적인 구원투쟁을 만들어내야 한다. 더군다나 손괴된 원전부터 내뿜는 고농도 방사능에 의해 수백만 명 사람들이 피폭의 위기에 노출되어 있다. ‘안전 신화’ 끝에 6기의 원전이 제어를 잃고 폭발을 되풀이하고 있다. 일 이 지경에 이름에도 정부,원자력 안전보안원, 도쿄전력은 무엇이 실제로 생기고 있는지 그 진실을 계속 은폐하고 있다. 멜트다운의 파국 회피를 위해 모든 힘을 결집해야 하는 데도 모든 것이 선수를 빼앗겨 수세가 되어 있다. 정보도 더이상 감추기 어려운 사실 밖에는 아무 것도 밝혀지지 않았다. 전부는 모든 정보를 밣히고 최악의 사태를 회피하기 위해 원전반대파들을 포함한 전문가들의 모든 지혜와 힘을 결집하라. 주민 피난 대책을 마련하라. 이번 거대지진이 이르킨 무서운 사태의 많은 부분은 신자유주의가 가져온 것이다. 지자체 해체화 재정파탄,공공 인프라의 민영화에 인한 해체, 끝없는 공무원노동자 삭감 등 국철민영화 이래 4반세기에 걸친 신자유주의 정책은 재해에 대한 저항력을 빼앗아 갔다. 특히 팽개친 지방 지역에서는 대진재가 결정적으로 파국화 했다. 게다가 이제부터 일어나는 것은 모든 것을 완전히 바꾸는 노동자에 대한 전면 공격이다. 방대한 해고, 임금 삭감과 대형 실업이다. 이러한 무든 것에 맞서 살아가기 위해 투쟁해야 한다. 노동자의 단결된 힘으로 피해지를 전력으로 구원하자. – 각지부는 의료품(속옷,생리용품 포함)/쌀,식료품(보존이 되는 것)/담요/기타 생활용품 등의 자진피해 구원 물자를 집중해 주십시오. – 각지부가 지원 캄파에 대처 하는 것을 당부합니다. The huge earthquake on March 11th has brought about a large-scale disaster to Northeastern Japan and the rest of the whole area of East Japan. We have not yet got the whole picture of what happened and what is actually happening: how many lives are lost, how many people are now seeking rescue, and so on. At this very moment, many lives are being lost. Few shelters are provided with water, food, electricity, or medical treatment. Moreover, Fukushima nuclear plants are running out of control through fatal failure of cooling systems and are precipitating into catastrophe after two blasts of nuclear facilities. Government’s rescue plan has been bankrupted. Let’s organize relief action of the affected people and area by workers’ unity and solidarity. Of course, the huge East Japan earthquake and ensuing Tsunami were beyond all anticipation. It is, however, evident that enough measure has not been taken to confront earthquake even though it had been warned that a big earthquake would occur within 10 years with 99% certainty. The reality was that neo-liberal agenda has been carried out on the principle of “competition and self-responsibility” at the sacrifice of local communities and lives of working people. Local governments were in a critical financial difficulty and in a situation far from preparing for possible earthquake. Expanding earthquake disaster is an inevitable result of this. 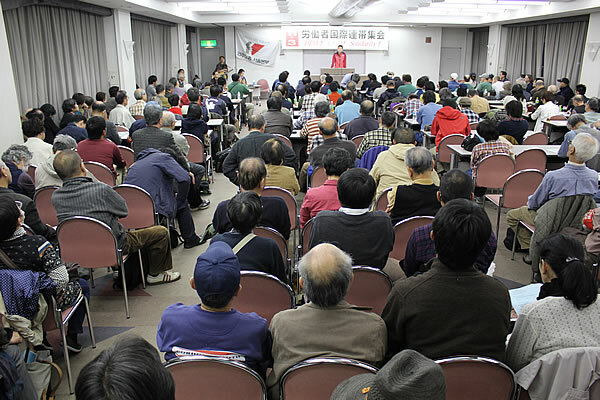 What is happening now in Fukushima is a typical example of the bankruptcy of local communities. Inhabitants of the area within radius of 20 kilo meters from the nuclear plants are driven out of their houses which are barely escaped from the earthquake, in the cold weather under the winter sky. Numerous people are contaminated by the blasts of nuclear facilities. The nuclear plants were built on the “nests of earthquake” by the government and electric power corporations, which insisted that the nuclear plants were absolutely safe and offered clean energy. It proved to be blatant lie. Nuclear plant meant for capitalists a miracle instrument to bring about a huge amount of profit and for the government a vital tool for nuclear armament. It has been exposed in the worst form what these policies really meant. It is reported that the troops of the Self-Defense Forces are going to put the main roads toward the affected region under their control. The rescue activities of a large number of people anxious about the situation of affected inhabitants are blocked in the name of “securing the rescue route” by the SDF. Even minimum physical distribution is stopped: three days after the earthquake, foodstuffs have disappeared from super markets not only in affected regions but also in the Tokyo metropolitan area. While the SDF is dominating everywhere, rescue activities and transportation and distribution of rescue goods are in trouble. Surprisingly, the US nuclear aircraft carrier, Ronald Reagan, has arrived at a harbor adjoining the affected area. Even in face of the reality, in which tens of thousands of people are still buried under the wreck or waiting for rescue in isolation, public security is the priority agenda for the government and ruling class. An attempt is under way to establish a wartime mobilization system under the slogan of “national unity to overcome national crisis”. It is evident that all essential information especially on the nuclear accidents is manipulated and the facts are cautiously concealed. Even the violent blasts of the unit 1 and 3 of Fukushima Daiichi nuclear plant are described as not serious problem and we are not at all informed of what is actually developing on the site of the accidents while a large volume of radioactive materials are leaking from the reactors and meltdown is imminent. 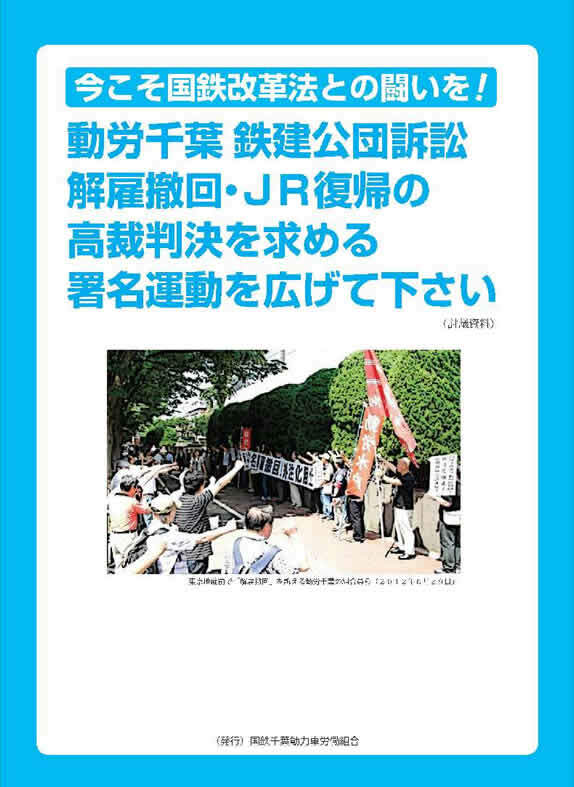 At this critical moment when all efforts should be made to prevent meltdown of the reactor, the only concern of the government and TEPCO (Tokyo Electric Power Company) is how to maintain their policy of promoting nuclear power. 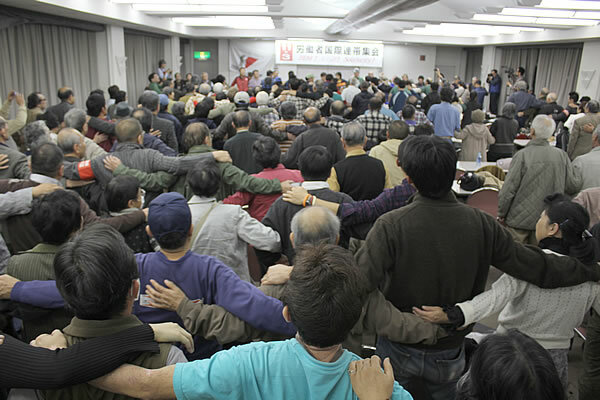 All political forces, governing Democratic Party of Kan administration, Liberal Democratic Party, Komei Party and others, are joining in “political truce” in face of the huge earthquake and going to present rescue measures, including “tax hike for restoration” “revision of the budget by cutting child-support allowance” “finance for damaged corporation” “finance aids for restoration” etc. Their aim is to overcome the present social crisis through an overall exploitation and plundering of working people, taking opportunity of horrifying situation of the affected people and regions. What is desperately needed for the workers, farmers, fishermen and small business, who have lost everything by the earthquake and Tsunami, is not financial aids but the place to live, means to survive, unconditional free medical treatment, etc. To be abolished is not child-support allowance but defense budget. 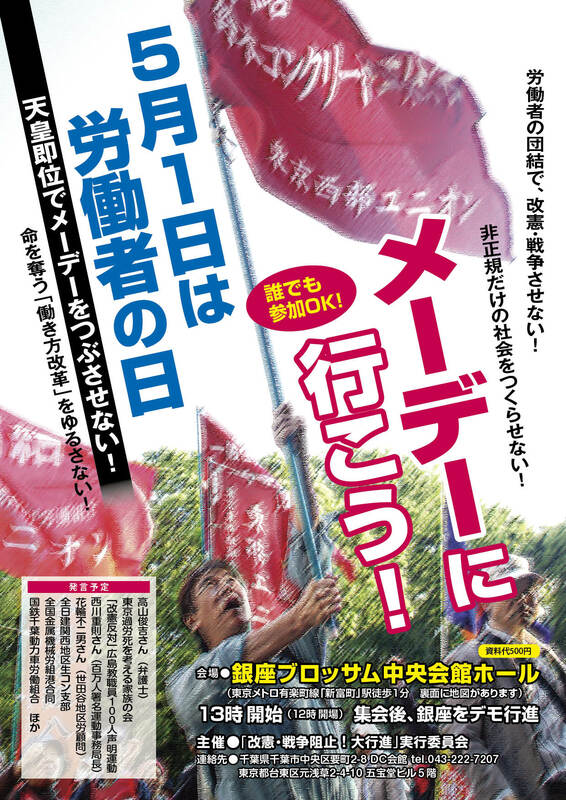 In the whole area of East Japan, numerous workers have already lost their jobs. Even in Chiba prefecture, 500 kilometer far from the seismic center, the Bay Area is attacked by liquefaction: streets and buildings are severely cracked. Large-scale fires are raging in the industrial complex. Almost half of the whole Japanese land is suffering from a severe damage and Japanese economy is hit by a devastating blow. The result is an all-out assault on workers: massive dismissal under the pretext of the earthquake and a large-scale unemployment. The huge East Japan earthquake is going to effect a total change over the Japanese society. Workers’ situation had just arrived at a critical point when the earthquake came. 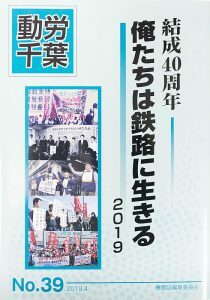 We have experienced in the past year a violent storm of mass dismissal: dismissal by the privatization of the Social Security Agency, JAL’s dismissal of designated workers, dismissal of several thousands workers of irregular employment by JP (Japan Post), etc. A large number of workers have been thrust into irregular employment or working poor. While the social security system has been considerably dismantled, it has become more and more difficult to survive everyday for working people. Just at this moment, the huge earthquake broke out, giving a fatal blow to those people who are on the brink of existence. 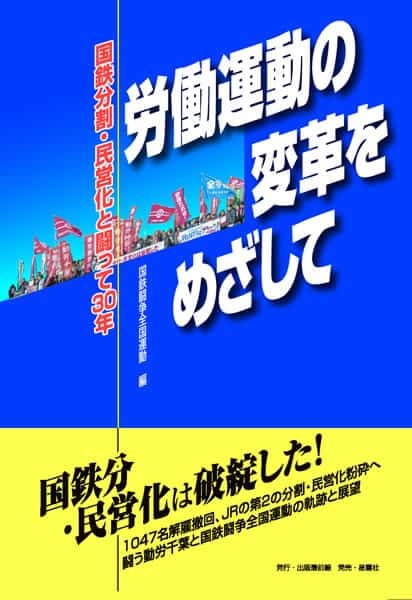 The ruling classes of the whole world are horrified to witness a critical situation, in which the collapse of economy is spreading from Japanese to other countries in the midst of the global economic crisis and explosion of angry voices of working class, ignited by these developments, is shaking the entire world. of labor movement through gathering angry voices of workers and organizing powerful actions. Now is the precise moment to promote this effort vigorously. Organize relief action of workers’ unity and solidarity for the affected people and areas with all of our power! We demand enough and immediate supply of housing, foodstuffs and medical treatment unconditionally for all the affected people! Stop immediately all the nuclear plants! Let’s give a decisive and final blow to neo-liberalism! Labor union shall stand in the forefront of this struggle!